Lacie wanted to take some shots with her sitting on top of the goal. Sounds cool, right? Well….Lacie failed to mention she was afraid of heights. After she climbed up there she was hugging the top and having a hard time gaining composure to sit up. We finally achieved a pose and took some great pictures of her up there. And then we had to get her down. Not so easy! At one point I was going to call the fire department and then I remembered I could just go retrieve our ladder from home. But before I ran home I thought we would try one thing. 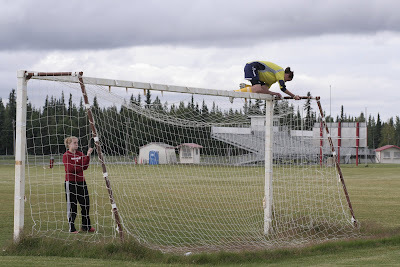 I had her climb down the net on the side. It worked, yay! I could show you all the cool pictures from the shoot but I have decided to show you the pictures from the great goal adventure. At one point I am taking pictures of her stuck up there and she is screaming at me “Why are you taking pictures NOW?” I was laughing so hard I was crying.